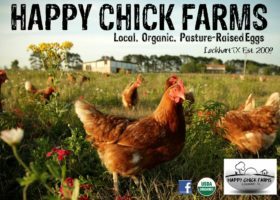 Happy Chick Farms is a family owned and operated Certified Organic Farm. We have been using humane and sustainable practices to provide eggs to the Central Texas area since 2010. We are committed to making the best eggs possible and doing our part to provide the local community with a wholesome, fresh product without the over distribution and industrialization that often degrades our food supply. We hand feed the hens, hand gather the eggs, provide all-day outdoor access, and feed a high quality non-GMO diet from Coyote Creek Organic Feed Mill in Elgin TX.